8pp., 8vo, grey printed paper wraps, aged, wraps partly detached, corners bumped, mainly good.It commences: "The Seniors of Trinity / By Newton's bones they swore [ ... ]" Copies in copyright libraries re. COPAC/WorldCat. [ Thomas Faed, RA, Scottish artist. ] Printed handbill poem in Scottish dialect by 'Tom Faed', titled '"The Shadow"', and beginning 'Oh wae is me! - I sit alane'. 1p., 12mo. Nicely printed on one side of a piece of laid watermarked paper. In good condition, lightly aged and worn, with slight loss to one corner caused by removal from an album. Sixteen-line poem in four four-line stanzas. Signed in type at foot 'TOM FAED.' The poem is a lament by the betrothed of a sailor drowned in the Firth of Forth. The first stanza reads: 'Oh wae is me! [Methuen] Autograph Letter Signed to Robert Lynd, author. Sir Algernon Methuen [né Stedman] (1856-1924), publisher. ALS, on letterhead of New Place, Haslemere, Surrey; 3 April 1922, 2pp., 12mo, good condition. Regarding his Anthology of Modern Verse (1922), to which RL wrote the introduction. 'I can see at once that some of your suggestions I shall accept but some I jib at for various reasons [...] 2) Bridges The Idle Flowers seems too like a Catalogue. Sassoon suggests Recollections [...] 4) Hardy wants Farewell. - & some other impossibles. 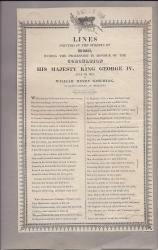 [...] 6) Meynell She does not want She walks (N.B. authors are asses.) [...] 9) Yeats Innisfree??? omit'. [E. Cecil Mornington Roberts.] Holograph Poem (signed 'Cecil Roberts'), a sonnet titled 'Liberty Challenged' ('Not without cause just and unshakeable'). 1p., 4to. In fair condition, on aged, creased and worn paper. The poem features under the title 'Liberty Imperilled' in Roberts's collection 'Charing Cross and Other Poems of the Period' (1919), and the context suggests that the poem was composed at the commencement of the First World War. The sonnet begins: 'Not without cause just and unshakeable | Will we surrender up the cherished prize | Of individual liberty, so well | and nobly held'. Oxford, 1950, published by the editors (students). pp., 8vo, paper wraps. Contributors include J.B. Donne, Donald Watt, Michell Raper. One copy listed on COPAC/OCLC, at Oxford. The Tercentenary of Corydon. A Bucolic Drama in Three Acts. "Novus Homo", pseud. William John Courthope, sometime Professor of Poetry at Oxford. iv:29pp., printed green paper wraps, corners a little turned, slight wear to spine, slight discolorarion of wraps, mainly good condition. Scarce: Four copies recorded on COPAC. "Second Edition", Simpkin, Marshall, London, 1839. 134pp., 8vo, in modern blue leather gt, raised bands, marbled endpapers, staining throughout affecting c.25% of each page, pages trimmed, but text clear and complete, with no loss of text except the very top of the letters written in the author's inscription. INSCRIPTION (titlepage): W.J. Mercer | from Lt General T. Charlton Smith | the Author | Nov.: 1874||". Mercer, presumably has added: "T.C.S. wrote this when a Captain in 27th. Regt. He sent copy to T. Moore, who apporioved the squib. The General was a Peninsular & Waterloo man: at Waterloo he was wounded. 29 April 1895, on letterhead of the Hôtel Burlington, Boscombe, Bournemouth. English actor, playwright, songwriter (1856-1914). One page, 8vo. "Sir Maple is a handy man / And comfort round him spreads, / He furnishes on every plan / And also makes the beds." In bad condition, torn and holed by removal from mount, traces of which are glued to the reverse. To the Brave of the Land of the Mimosa. The Japanese. (Poem). No place or date but 1905-ish. Printed Handbill, c.7.5 x 12", pink paper, fold marks, sl. tear on folds. An exhortation to the Japanese against the Russians commencing "Heed not the boasting Russian horde who claim our dearest rights, / Hold we our heads aloft, stand firm, in many glorious fights; / Forward - ye sons of Fair Japan . . ./ Sedition enters not our ranks as in the Russian host . . ./ They shall lead us to Port Arthur, our Standard there shall soar . . ./ . .. the treacherous Muscovite . . . / Anarchy looms in the distance . . ./ The innocent who have been sacrificed in Siberia's icy zone . . .".